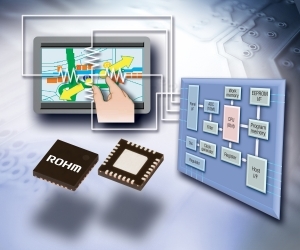 The new BU21023/BU21024 series of high-speed, high noise immunity, low-voltage resistive touchscreen controllers is now available from ROHM Semiconductor. These new controllers are the industry’s first to enable multi-touch (two-point) operation and intuitive gesture control, including pinching, spreading and rotating – previously possible only with more expensive capacitive touch systems. The increasing functionality and sophistication of electronic devices drives the demand for touchscreens which are preferred for their ease of use and versatility. In addition they enable direct interaction without the need for input devices. Resistive touchscreens account for over 75 per cent of the touchscreen market, due in large part to their lower cost and higher precision when compared to capacitive technologies. Another advantage is that they allow operation with fingernails or even while wearing gloves, unlike capacitive touchscreens that require a conductor or dielectric. Touchscreen panels are used in a wide variety of applications, including cellular telephones and car navigation systems, said Nick Ikuta, Sr. Technical Marketing Manager at ROHM. The functionality of electronic devices is increasing day by day and operation by touch panel is increasingly shifting toward pinch, spread and other intuitive finger gestures. Until now, in order to actualize functions like these, electrostatic capacitance type touchscreens were the only choice. With the new BU21023/BU21024 series, conventional 4-wire resistive touchscreen designs can be easily expanded to include dual-touch. The BU21023/BU21024 series ICs integrate a dedicated analog circuit and CPU for precise two-point coordinate and gesture detection. A calibration function is also built-in that minimises the effects of panel variations during production as well as fluctuations in touchscreen device characteristics caused by temperature variations or time-based degradation.